The track itself is a 1/8 mile clay oval with progressively banked turns. 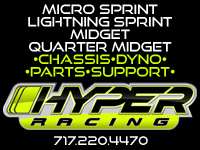 We offer five divisions of sprint car racing each night: 600cc, 270cc, Sportsman, 125cc and 250cc 4 Stroke. Annually we host the USAC National Midget Tour and also have special appearances of the Wingless 600s and Slingshots. The famous track is considered to be a jewel and is highly known for “foot to floor”, “ripping the lip” and “riding the rail” racing action. Clyde Martin Memorial Speedway, also known as Lanco, offers great views, the concessions are one of the best, the spectator bleachers are superb, along with clean restrooms and free parking. Clyde Martin Memorial Speedway ranks among one of the top tracks anywhere on the east coast. The facilities and the track offer the best racing and family entertainment. 2019 is our 62nd season of promoting professional sprint car racing. We welcome you to the "Biggest Little Track" known as the "Clyde".